If any celebrity is going to have an incredible swimming pool, it would be Celine Dion. The Canadian mega singing star has had an unbelievably successful career thus far, and all of her sold-out concerts and her Las Vegas residency has solidified her as one of the highest-paid singers in history. With all that money, the songstress can certainly afford to have a lavish home with an even more opulent pool area. 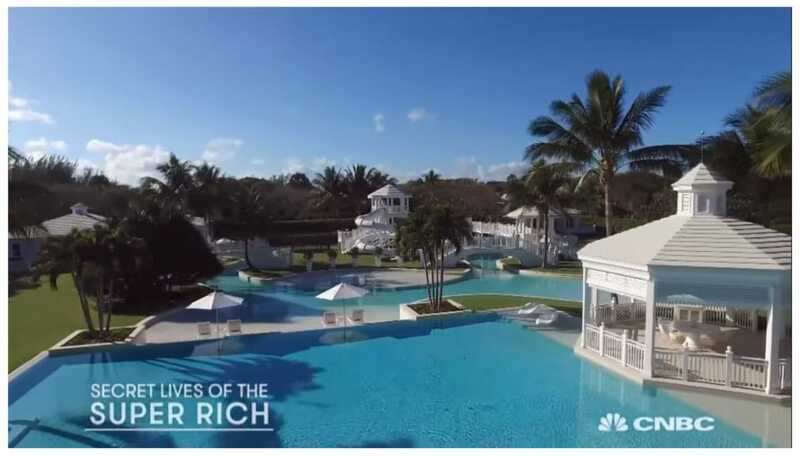 The home, located in Jupiter Island, Florida, was recently sold by Ms. Dion, but the pool’s legend still lives on. The pool is a lagoon style, surrounded by meticulously-maintained green space, eating spaces, lounge areas, bridges, water slides, cabanas, and pool houses. It truly is a water park all on its own. In fact, the pool area itself is its own little island oasis. The pool area is actually made up of two pools which are connected by the water park. In the middle of the pool is a gorgeous circular fire pit, with an equal circular sofa surrounding the pit for maximum in comfort and convenience. Celine and her family and friends can lounge by the crackling fire while still being surrounded by the crystal blue waters of the swimming pool. One of the pools is ocean front and is literally just steps away from the Atlantic Ocean and sandy beach. It’s waterfront living at its finest. While the Grammy award-winning singer can definitely afford to have a luxury pool like this, there’s little reason why the average homeowner can’t. Perhaps on a smaller and less expensive scale, but lavish pools and surrounding outdoor living spaces can be achieved with the help of a skilled and experienced Austin pool builder. If you’re considering decking your backyard space out in a stylish and sophisticated swimming pool, be sure to get in touch with your trusted Austin swimming pool builder today to put your plans in motion.